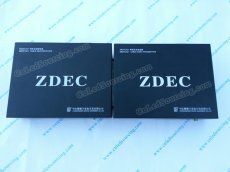 ZDEC main cable transmitter---M62TCA01 and receiver---M62RCA01 as a set is compatible with full color LED control system V601 ZQLS-PC-01 (out of production and stock). Please rest assured to buy it. Payment method: we only accept Western Union or Wire Transfer for this product. 1. When frame rate is 60Hz, the maximum load capacity of transmitting card is 1.31 million pixels (the maximum output height is 1024 pixels and the maximum output width is 1920 pixels). On this basic, it also supports output images with custom resolution and custom display position. 3. LED Manager V6.2 is supported. It can achieve a variety of functions cooperating with LED Manager V6.2. 4. Supports 100 level brightness adjustment and 16 levels chip brightness adjustment. 5. Each output port can customize the location and output resolution. 6. Supports the environment monitor A52ED-02 / A52ED03. 7. Supports status report for Ethernet. it is dim, means no power supply. is always bright, means Receiver working normally. flickers, that means no receiving data. The controller system works perfectly, excellent service. Thank you very my much, DEAR!